Part of a longstanding collaboration with Italian Navy divers, the impressive Militare Chrono Bronze flexes its horological muscle. Perhaps the most striking feature of this watch, which is sculpted from a bronze alloy with zinc, is its remarkable legibility. Prominently placed at 12 o'clock and protected by patented mobile hinges, the crown meets the demands of a true professional tool, with optimal grip and indications that are set in the most uncomplicated way imaginable, whatever the circumstances. This powerful aesthetic continues on the pared-down brown dial that is brought to life by a reliable and no less precise automatic movement. 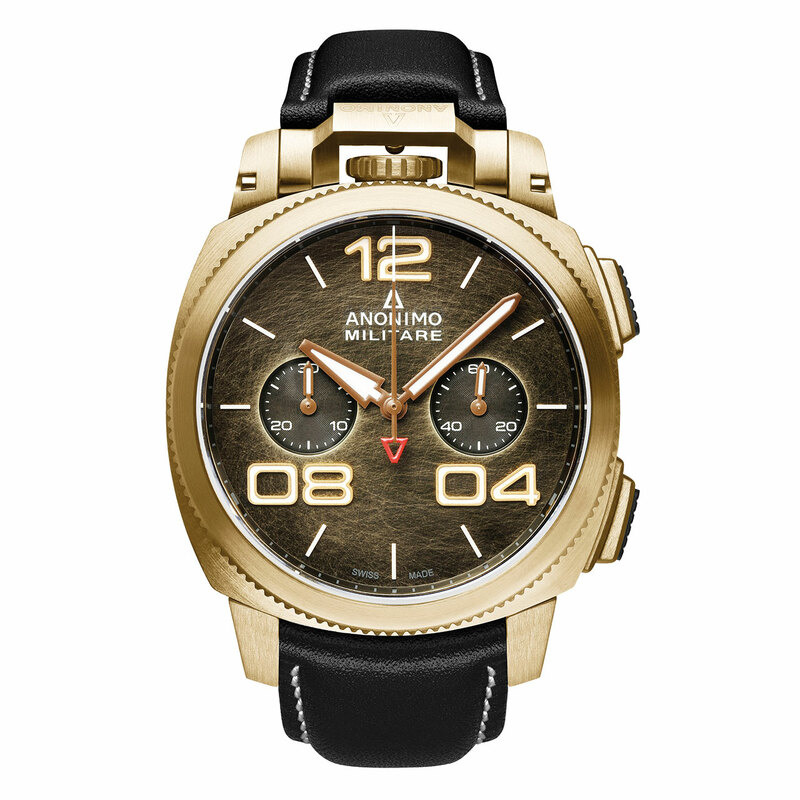 The sleek, masculine lines of the Militare Chrono Bronze have earned it cult status, and understandably so. Since its creation in 2001, it has embodied the most accomplished combination of Italian design and the best Swiss technical developments. Mechanical automatic, Sellita SW300 calibre with Dubois Dépraz 2035T chronograph module. Bronze, 43 mm. Patented mobile hinges protecting the crown at 12 o'clock. Titanium back. Water-resistant to 120 metres (12 bar/400 ft). Brown. Small seconds at 3 o'clock, minute counter at 9 o'clock. White hour-markers and hands.